HMH Books for Young Readers, 9780544991477, 320pp. Adrianne Finlay received her PhD in literature and creative writing from Binghamton University. Originally from Ithaca, New York, she now lives in Cedar Falls, Iowa with her husband, the poet J. D. Schraffenberger, and their two young daughters. She is an associate professor of English and the Program Director of Creative Writing at Upper Iowa University in Fayette, Iowa. When she’s not writing, reading, or grading, she’s making soap to sell locally, raising money for type 1 diabetes research. 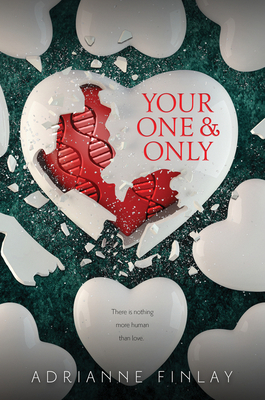 "Haunting, moving and provocative, Your One & Only asks questions that will linger after you're finished reading—Adrianne Finlay is a debut to watch." "This is such a fascinating, clever story, with characters I truly grew to love and a plot that never stopped moving! As soon as I started reading, I found myself turning pages furiously, so excited to see what would happen next. A truly original and inventive story for my fellow lovers of sci-fi."